Annica is a sorrel, overo mare with one blue eye. She can be triple registered (American Paint Pony, American Paint Horse, and The Pinto Horse Association). Her sire and dam are both registered Paints. Annica has been training well in Hunter/Jumper, Western Pleasure, Showmanship, and Halter. She has unbound potential but excels in English Pleasure and Jumping. She has been shown once and was amazing! She loads, hauls, clips, and bathes without problems. Annica is extremely sweet, calm, and quiet with a loving disposition that would make her a wonderful pony for an intermediate rider. 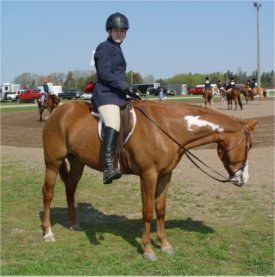 Her potential exists in 4-H, Pony Club, Pinto, or on the Hunter/Jumper Circuit. 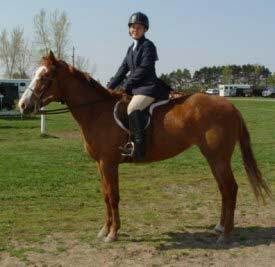 She will make an extremely competitive English Pleasure Pony!